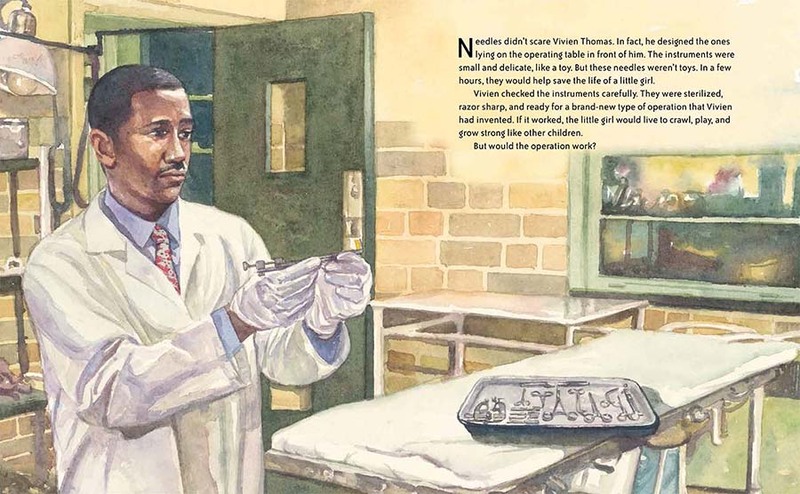 Summary: Vivien Thomas dreamed of becoming a doctor, but when the Great Depression hit, he lost all his college savings. Determined to pursue a medical career, he found a job as a research assistant for Dr. Alfred Blalock at Vanderbilt University. Vivien proved to be a quick study and soon was conducting his own experiments and mastering surgical skills like suturing blood vessels. In 1941, Dr. Blalock was offered a job at Johns Hopkins University. He accepted it on the condition that Vivien would go with him. At Johns Hopkins, the two men met Dr. Helen Taussig, a pediatric cardiologist who was trying to find a cure for so-called “blue-babies” whose skin turned blue because of a heart defect. 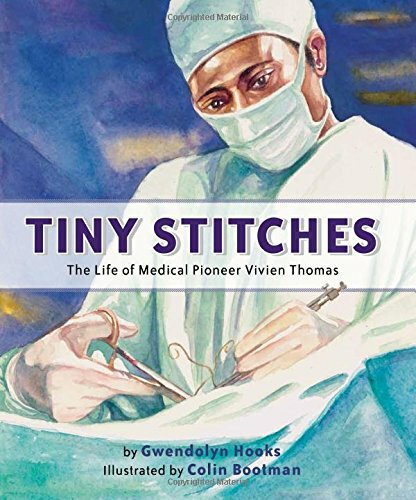 Vivien Thomas ended up doing a large portion of the research, developing a procedure, and designing a needle tiny enough to do the surgery. When Dr. Blalock performed the ground-breaking surgery in 1944, it was Vivien who stood behind him and coached him, a role he would continue to play after the first surgery was a success. More than a quarter of a century went by before Vivien finally got the recognition he deserved, having his portrait hung in Johns Hopkins Hospital and being awarded an honorary doctorate. Back matter includes more information about the surgical procedure and Vivien Thomas, as well as a medical glossary and sources. 32 pages; grades 2-5. Pros: A compelling story of a little-known African-American scientist who overcame a myriad of prejudices to make an important contribution to medicine. Kids who find this book interesting may want to read last year’s Breakthrough! How Three People Saved “Blue Babies” and Changed Medicine Forever by Jim Murphy. Cons: There is a lot of text and somewhat technical information for a picture book.